I'M BACK at Peanut Road and it's time to get busy again. The first order of business, I suppose, being to transfer Ms Garcia's concert to the computer and begin editing it. I'm feeling lazy but I'll get to it soon! 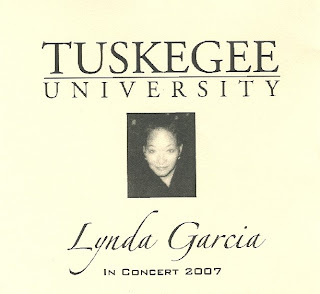 Her recital (and my recording) at Tuskegee went well enough. Lynda played all electronic keyboard this year so my usual close-up recording technique had to be replaced with directional mikes up in the balcony. I think it worked well enough. If the University had a decent sound system (it hasn't really been upgraded since the Chapel was built in the 50s), she could have plugged into that and I could have taken a stereo line into my Fostex, along with a couple ambient mikes, but instead I just pointed what I had (in X/Y array) at her pair of Roland keyboard amps. I will be going back in three weeks to record the Christmas Concert once again. More than likely I'll have to use the same technique then. The Chapel is really a very nice large concert hall and I definitely recommend the Christmas Concert to anyone who can make it to Tuskegee AL on Dec 2 (Sunday, 6 PM). The Golden Voices Choir will be performing, directed by Dr Wayne Barr (who also is an excellent organist) and accompanied by Lynda Garcia. And it's free! The other half of my weekend was the Florida Folk Festival. Alas -- for various reasons with which I will not bore you, dear reader -- I ended up spending only Saturday there in White Springs. 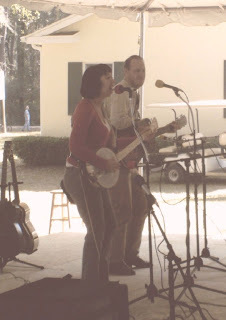 I snapped a few poor-quality pics of Mary and Frank playing that morning and then spent the day with them as they went about video taping performers for the Cafe Americana program. I tried to direct them toward some of my own favorites, naturally -- the Makley Family, Joey Errigo, Roseville Fair, Veronika Jackson. I suspect that they got some other acts on tape yesterday, but I had to leave Saturday evening. But I had fun while I was there -- despite being a roadie rather than a performer :) -- and kept my perfect attendance record intact. This was the seventh one for me. Of course, I intend to be there again in May! And maybe someday, I'll actually be able to spend some time in the campground. Preferably when the weather is WARM!